Magnum ice cream bars are very popular throughout the South Pacific. There are a lot of flavors: peppermint, double ego caramel, of course the original, salted caramel, and a lot of others. My favorite type of bar is called 'Americana Chocolate Cookie Crumble' with a white chocolate outside and chocolate ice cream inside. 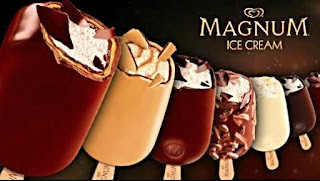 My goal right now is to try every flavor of Magnum bar, but I just can't bring myself to try cappuccino, even though I like the taste of coffee. I guess it could taste different in ice cream. I made a whole Magnum bar section in my scrap book. Yummy yummy, Magnum bars in my tummy. Can you get Magnum bars in the U.S.?